Courier Country landmarks will be showcased by tourism bloggers to celebrate a new film set in Scotland. Neil Robertson and David Weinczok will be racing to visit as many film and real-life locations associated with Robert the Bruce in 36 hours to mark the release of Outlaw King on streaming site Netflix. Locations include Scone Palace, where Robert the Bruce was crowned, Arbroath Abbey, and Dunfermline Abbey, where he is buried and where the challenge will end. The will also visit the Battle of Bannockburn, Glasgow Cathedral and Loudon Hill. Outlaw King will be released on Friday and was shot entirely in Scotland. Dozens of locations were used during production and it thought to be the biggest-budget film made in the country to date. Outlaw King tells the story of Robert the Bruce, from defeated nobleman in 1304 to victorious King of Scots at the Battle of Loudoun Hill in 1307. With visitors flocking to Scotland after seeing its beauty in productions including Outlander and Harry Potter, it is hoped Outlaw King will boost tourism even further. 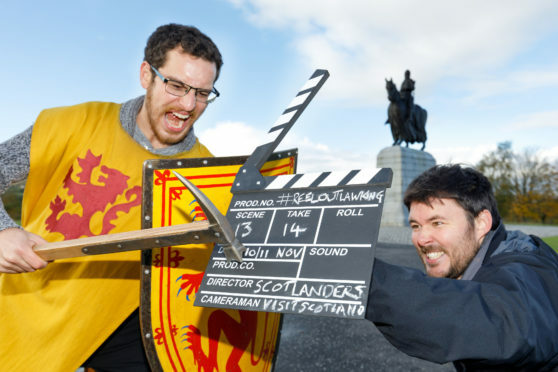 Jenni Steele, film and creative industries manager at VisitScotland, said: “Robert the Bruce is a Scottish icon whose story enthrals visitors from across the globe and we’re excited to see so much of Scotland on screen in Outlaw King and streaming straight into the homes of millions of Netflix subscribers. “Outlaw King presents an excellent opportunity for the Scottish tourism industry to turn viewers into visitors, especially as Scotland offers film fans the unique chance to not only walk in the footsteps of its on-screen stars but also those of their real-life counterparts. Film buffs can take virtual tour of locations by tracking Neil’s movements using the hashtag #ReelOutlawKing on Twitter and Instagram, while history fans can explore the real sites linked to the King of Scots by following David and the hashtag #RealOutlawKing. Scone Palace’s Lady Mansfield said: “As the place where Robert the Bruce was crowned, Scone Palace is delighted to be part of VisitScotland’s Outlaw King challenge.